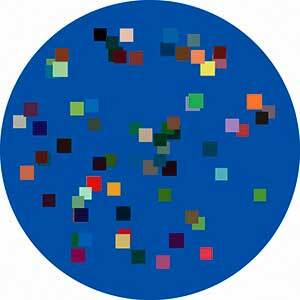 As is the case with Colors 2: And Not, the pieces in this group are constructed with a controlled use of random numbers. Randomness becomes "focused" through containment within the parameters I have set. For example, the marks in each work don't vary much in size, but they do vary. One goal is to produce abstractions that are devoid of certain kinds of "self-expression," open instead to the wider universe. 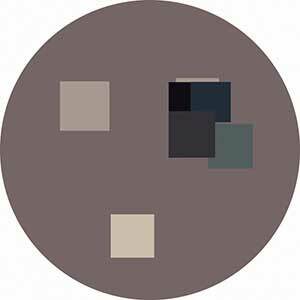 Each pattern serves as the basis of three works, one in "full color" and two much grayer. The final sizes vary hugely. Each work is an edition of one, meant to stand on its own. Each can also be displayed in any one of the four possible orientations. I can envision seeing all three versions of the same pattern displayed together, but also, a display of only the grayest; I can envision similar sizes together, but also, an exhibition that emphasizes the wide disparity of sizes. 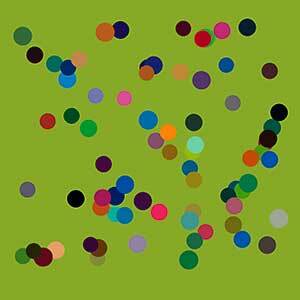 A large exhibition of Colors 3: Circles and Squares would ideally contain varied types of groupings such as these. 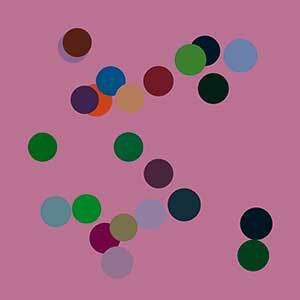 Scroll through the works of Colors 3: Circles and Squares completed thus far. Links by title to the works of Colors 3: Circles and Squares completed thus far.